Looking at our 2013 Annual Report published in the January 2014 issue of Contact Lens Spectrum (http://www.clspectrum.com/articleviewer.aspx?articleID=109320), I think it is important to take note of one dismal statistic. It's not surprising that the bulk of our fits are in the spherical and toric categories, but an optimistic estimate of the percentage of multifocal fits of all lens fits 13% (and only 9-10% of soft lens fits). Yet, presbyopia is ubiquitous and presbyopic patients make up significant numbers in our practices so these percentages should be much higher. There are perhaps many reasons why this might be, but I believe that one reason is that many of us have given up on multifocals for all the wrong reasons. Today we have new technologies in this category that should allow for successful fitting in most of our patients. Look for more on this discussion in the coming months ahead. Johnson & Johnson Vision Care, Inc., announced the appointment of Millicent Knight, OD to the role of Head of Professional Affairs, Johnson & Johnson Vision Care, North America. In this role, Dr. Knight will lead the development and deployment of the company’s professional strategy across the United States and Canada. She will also direct its professional and education platform through The Vision Care Institute, LLC and other educational outreach programs. Dr. Knight will begin her new role effective April 7, 2014. Dr. Knight brings 25 years of comprehensive experience in multiple areas of optometry, including contact lenses, contact lens research, ocular disease management, and integrative eye and systemic care to the position. Dr. Knight began her career in a hospital based ophthalmology and optometry practice at a level one trauma center. She has owned two optometric practices where she was the principle driver of the practices clinical operations and financial performances, utilizing technology and broadening her conventional health care knowledge base to include natural and complementary approaches to enhance patient care delivery, while building diverse revenue streams and customer base. Dr. Knight has consulted for numerous eye and health care companies, conducted contact lens and solutions clinical trials, and lectured on contact lenses, leadership, cultural sensitivity, eye and systemic health, and business and entrepreneurship. She has served as an instructor at The Vision Care Institute and as a Professional Affairs Consultant for Johnson & Johnson Vision Care. Dr. Knight is a member of many organizations including the Illinois Optometric Association, American Optometric Association, and National Optometric Association. She has served on the board of trustees of Illinois College of Optometry, the National Advisory Eye Council and the National Eye Institute. Dr. Knight is a Certified Health Coach and a Fellow in the American Academy of Anti-Aging Medicine and a Kellogg Leadership Fellow. She was selected as optometrist of the year by the National Optometric Association in 1999 and by the Illinois Optometric Association in 2012. Alden Optical announced the new Astera Multifocal Toric Practice Locator Tool. This dynamic map based tool allows patients to easily locate practices fitting Alden Optical’s Astera Multifocal Toric. This tools prominent placement on the company’s website and Alden Optical’s sponsorship of AllAboutVision.com’s “Bifocal Contacts for Patients with Astigmatism” page will result in significant patient traffic to the map tool. The Astera Multifocal Toric gives practitioners a state-of-the art design to keep patients with astigmatism, who are reluctant to give up their soft contact lenses as a result of presbyopia, happy and in soft lenses. The Astera Multifocal Toric Practice Locator Tool can be found at: http://www.aldenoptical.com/patient-information/patient_information/#patientinfo. Alden’s AllAboutVision.com sponsored page can be found at: http://www.allaboutvision.com/contacts/bifocal-torics.htm. A new multipurpose hub for the European business of contact lens manufacturer Menicon Co., Ltd. (head office, Nagoya, Japan) has begun its first full year of operations at Emmen, Netherlands (140 km. NE of Amsterdam), following a December 2013 grand opening attended by dignitaries from the Netherlands and Japan. Combining in a single 4,675 square-meter structure the production, distribution, R&D, marketing and management functions of business units Menicon Holding BV (MHBV) and NKL Contactlenzen (acquired by Menicon in 2006), the facility creates an eco-friendly and efficient base for 100 staff in Menicon’s European operations. In keeping with its dedication to clear vision for people across the continent, the new glass-clad structure is remarkably transparent. And the glass cladding is equally remarkable for its environmental performance: adjustably admitting abundant natural light, yet well insulated against cold and heat. Other structural features contribute to power consumption 45% lower than comparable conventional structures. This translates into a 35% reduction in CO2 emissions, consistent with norms under the European Sustainability Programme. The new facility produces, made-to-order, both gas permeable and soft lenses that will be distributed (along with other Menicon products, such as disposable lenses and lens care supplies) Europe-wide by an on-site warehouse and logistics center. Upstairs, researchers are working on innovative lens designs, efficient production processes and the next generation of Easyfit software to support contact lens fitters all over the world. With an eye to possible future expansion, the structure has been built at the front of the 13,000 square-meter site, leaving room for another building as needed. 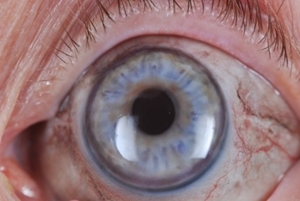 This is a picture of a hand-painted soft lens with clear 4mm pupil on damaged eye with 10mm irregular pupil. This patient had a traumatic injury which required cataract surgery and removal of most of her iris. Without this lens best corrected VA is less than 20/100. With this lens patient has 20/30 VA. The authors conclude that the Schirmer test seems to be influenced by the position of gaze. However, the mechanism for this effect remains unclear. Further studies, they suggested, could focus on whether an inferior gaze of 20° compresses the tear film falsely, thereby elevating the tear volume. The authors go on to recommend that the clinician adopt a standard eye position for the Schirmer test and that future reports provide specifics as to the methodology used. Bitton E, Wittich W. Influence of eye position on the Schirmer tear test. Cont Lens Anterior Eye. 2013 Dec 18. Always wash your hands prior to applying or removing contact lenses. Use a mild soap (e.g. Ivory or one provided by a contact lens laboratory). Antibacterials, lotions, or perfumes can easily transfer from hands to contact lenses. At night, remove lenses before removing makeup. The latter should be performed with mild soap and water. In my next column, I will review recommendations from the literature regarding makeup application and contact lens wear. 2. Bennett E and Wagner H Rigid lens care and patient education In: Bennett ES and Weissman BA, eds. Clinical Contact Lens Practice Lippincott, Williams & Wilkins, Philadelphia, Pennsylvania; 2005: 289. 3. Sindt C. Makeup and teens. Contact Lens Spectrum, Volume: 28, Issue: December 2013; 48. 4. Ward M. Contact Lenses and Makeup Contamination. Contact Lens Spectrum, Volume: 28, Issue: February 2013; 23. 5. Gromacki SJ. Mascara and Scleral GP Contact Lenses. In: Care Solution Corner; Contact Lenses Today, January 12, 2014. This study aimed to determine the probability and risk factors for developing a corneal inflammatory event (CIE) during daily wear of lotrafilcon A silicone hydrogel contact lenses. Eligible participants (n = 218) were fit with lotrafilcon A lenses for daily wear and followed up for 12 months. Participants were randomized to either a polyhexamethylene biguanide-preserved multipurpose solution or a one-step peroxide disinfection system. The main exposures of interest were bacterial contamination of lenses, cases, lid margins, and ocular surface. Kaplan-Meier (KM) plots were used to estimate the cumulative unadjusted probability of remaining free from a CIE, and multivariate Cox proportional hazards regression was used to model the hazard of experiencing a CIE. The KM unadjusted cumulative probability of remaining free from a CIE for both lens care groups combined was 92.3% (95% confidence interval [CI], 88.1 to 96.5%). There was one participant with microbial keratitis, five participants with asymptomatic infiltrates, and seven participants with contact lens peripheral ulcers, providing KM survival estimates of 92.8% (95% CI, 88.6 to 96.9%) and 98.1% (95% CI, 95.8 to 100.0%) for remaining free from noninfectious and symptomatic CIEs, respectively. The presence of substantial (>100 colony-forming units) coagulase-negative staphylococci bioburden on lid margins was associated with about a five-fold increased risk for the development of a CIE (p = 0.04). The researchers concluded that the probability of experiencing a CIE during daily wear of lotrafilcon A contact lenses is low, and symptomatic CIEs are rare. Patient factors, such as high levels of bacterial bioburden on lid margins, contribute to the development of noninfectious CIEs during daily wear of silicone hydrogel lenses.